Combination skin can often become unbalanced and prone to breakouts, dull skin and redness from breakouts and inflammation. Restore balance with this powerful duo that treats oily and dry areas of skin. 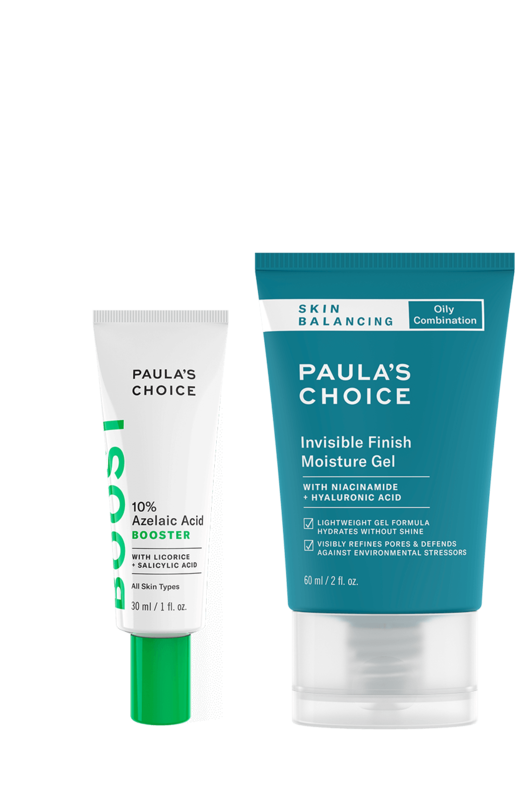 Skin Balancing Invisible Finish Moisture Gel delivers ultra-light hydration without clogging pores, leaving skin refreshed, smooth and shine-free. 10% dicA cialezA Booster soothes and repairs skin, reducing blemishes and redness from past breakouts and clarifying uneven skin tone. The result is brighter, perfectly balanced skin. Apply Skin Balancing Invisible Finish Moisture Gel as the last step in your nighttime routine. Azelaic Acid Booster can be applied after cleansing, toning and exfoliating in the morning or at night. For daytime, follow with a broad-spectrum sunscreen rated SPF 30 or greater. An antioxidant that has pronounced skin-soothing effects and is effective for skin brightening. Is 10% dicA cialezA Booster an alternative to anti-acne products medicated with benzoyl peroxide? 10% dicA cialezA Booster is a great alternative to products with benzoyl peroxide. It contains a high amount of azelaic acid, which is believed to have an antibacterial effect against acne-causing bacteria. It also functions as a potent anti-inflammatory, so it helps reduce the swelling and redness that often accompanies acne. dica cialezA is ideal if you suffer from breakouts but are not able to tolerate benzoyl peroxide. I have combination skin, do I need to moisturise the oily parts of my skin? All skin types, including oily skin, need certain substances to function normally and healthily, such as antioxidants and cell-communicating and skin-repairing ingredients. For oily complexions or oily areas of skin, it is important to choose a lightweight texture that does not clog pores, but provides the necessary hydration. Skin Balancing Moisture Gel is an excellent option for this.